It’s hard to believe that popular Cincinnati vocalist Ruby Wright passed away ten years ago this year. It’s perhaps even more difficult that today marks the centennial of her birth. One-hundred years ago, on January 8, 1914, Ruby Wright was born in Anderson, Indiana. Destined for a career in show business, Ruby’s musical career started as a teenager in high school in Indiana when she teamed up with two sisters whose last names were Call. They called themselves “The Call Girls and Ruby”—which certainly might raise a few eyebrows today. Soon-after, the trio broke up and Ruby was making plans to attend Indiana University when she attracted the attention of a popular regional band led by Charlie Davis. Ruby joined Davis’ band and toured with them throughout the Midwest, eventually landing a extended booking in New York at the New Yorker Hotel. It was during that stay that she met bandleader Barney Rapp whose group, the New Englanders, had gained a popular following on the East Coast. Rapp needed a vocalist and Ruby was hired. Among their early recordings is an MGM film short featuring the band and Ruby that can still be found today. The professional relationship between Rapp and Wright eventually turned personal and the two were married in 1937. The newlyweds decided to retire from the road and settle in one place. They had enjoyed their visits to Cincinnati and thought it would be a great place to reside. Rapp and Wright became regulars on WLW and WSAI and they also opened their own nightclub, the Sign of the Drum, near Bond Hill. In 1939, Ruby was expecting their first child and so Rapp had to find a substitute female vocalist, discovering a teenager named Doris Kappelhoff. Rapp changed the girl’s stage name to Doris Day—but that’s another story. The Sign of the Drum and radio work kept the family busy into the 1940s and by 1950, the couple used their experiences touring on the road to open a travel agency business. In the 1950s, with children growing older, Ruby decided to return to show business and was hired as a staff vocalist at WLW radio and WLWT television. 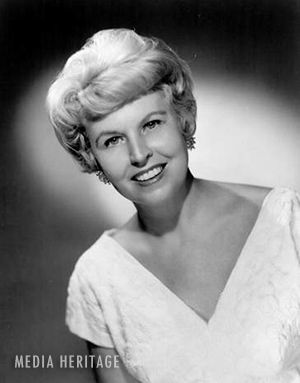 She appeared on several programs but is probably best remembered as a regular on Ruth Lyons’ “50-50 Club.” Wright was a favorite of Lyons and recorded several of her original works. Wright’s recording of Lyons’ “Everywhere the Bells Are Ringing” for Columbia Records in 1960 was nationally released. Ruby also worked extensively as a recording artist for Cincinnati’s King Records, making dozens of recordings between 1949 and 1959. Two recordings, “Bimbo” and “Three Stars” were particularly popular hits in Great Britain. After Ruth Lyons retired in 1967 and her husband, Barney, died in 1970, Ruby retired from her professional career one final time. However, she remained active in the local arts community, participating in historical reunions and concerts, and was inducted into the Cincinnati Broadcast Hall of Fame in 1992. Ruby passed away March 9, 2004.